The complex, scratched, painterly and toned backgrounds of Walds monotypes give one a subtle approximation of stage lighting, bringing interest to dead spaces on the page. The longing on the face of the figures, their solitary, beseeching nature on pulpit, or soapbox, the madness within the image, and the exaltation of that madness by prominent art world parallels, and by central positioning on the page is elegant. The imagery within the mainly positive field monotype: ‘Cat. No. 48. 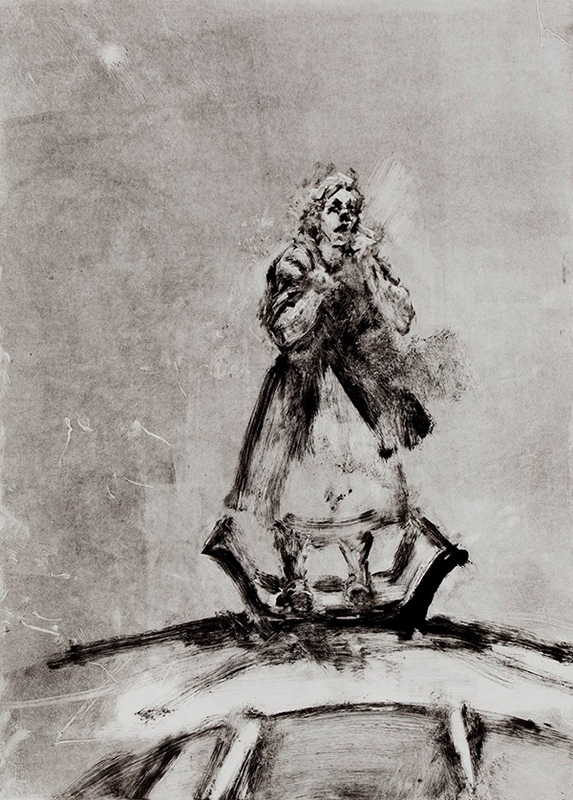 The Exile Trilogy: Levad 4’, painted, drawn, scratched and printed with black ink on Hahnemuhle paper by Susan Wald is similar to the grotesque, searching, and ever hungry, gaping maw of individuals in Goya’s paintings and prints. The depicted foul appetites of the robed clergy of: Los Caprichos ‘No. 80: Ya es hora’, and the further heated, gluttons of: ‘No. 13 Están calientes’, all share prominent open mouths, with numerous Goya works on paper, paintings on bone, and canvas. The important, giant, cannibalistic, infantilist within ‘Saturn Devouring His Son’, c. 1819–1823. (Oil mural transferred to canvas, 143cm x 81cm. Museo del Prado, Madrid), draws the most true visual connections with the solitary/Levad, Wald monotype figure. Monotypes tend to be small in size, and the confident, nay, monumental size of ‘The Exile Trilogy: Levad 4’, and its cohorts, gives the works a gravitas or grandeur. The artist is not dabbling or sketching, these are gallery pieces and should be treated as such. 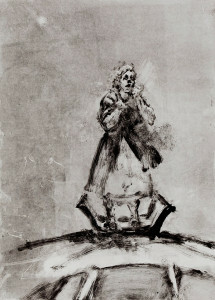 Wald first made monotypes whilst in art school in 1989-91, and continues to make them in conjunction with her painting. Unlike most monotypists, who use the medium for a short time and discard it, Wald is building an important body of both figurative and landscape monotypes.